NEW YORK, Mar 19 2015 (IPS) - There’s little argument about the basic facts: It’s ugly (think strip malls and big box stores). It’s not very convenient (hours spent behind the wheel to get to work). And it wreaks havoc on the natural environment (lost farmland and compromised watersheds). 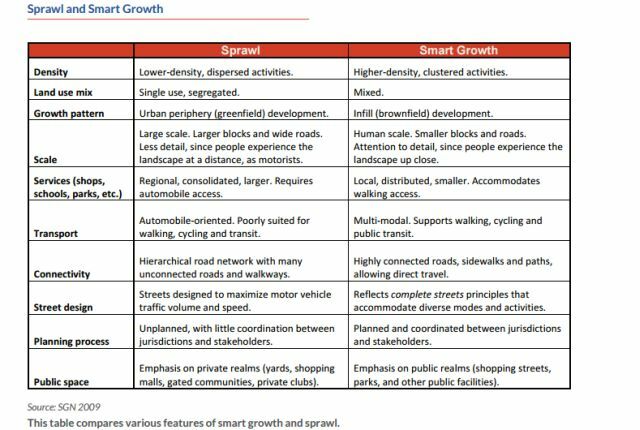 So why is “urban sprawl”, the steady creep outward of cities to more rural areas and corresponding heavy reliance on cars to commute anywhere, just getting worse? Experts like Todd Litman of the Victoria Transport Policy Institute in British Columbia say it’s a matter of what planners call smart growth – or lack thereof. “Much of the motivation for middle-class households to move from cities to suburbs was to distance themselves from lower-income households that cannot afford single-family homes and automobile transportation,” he told IPS. The list of woes this segregation created is not short, and includes reduced agricultural and ecological productivity, increased public infrastructure and service costs, increased transport costs, traffic congestion, accidents, pollution emissions, reduced accessibility for non-drivers, and reduced public fitness and health. 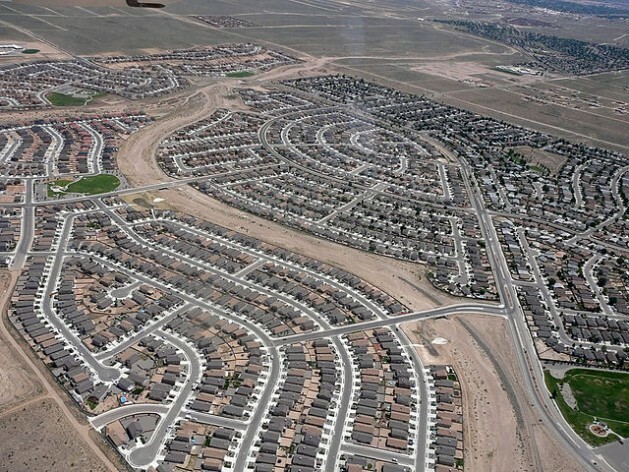 In fact, a new analysis released Thursday by the New Climate Economy, the Victoria Institute, and LSE Cities finds that sprawl imposes more than 400 billion dollars in external costs and 625 billion in internal costs annually in the U.S. alone. Poor communities get even poorer, and research shows that this concentration of poverty increases social problems like crime and drug addiction, stacking the odds against inner city children from the very start. By contrast, says Litman, the study’s lead author, “smart growth consists of compact neighbourhoods with diverse housing and transportation options which accommodate diverse types of households – young, old, rich, poor, people with disabilities – and residents can choose the most efficient mode for each trip: walking and cycling for local errands, high quality public transit when traveling on busy urban corridors, and automobiles when they are truly optimal overall, considering all impacts. “This type of development tends to reduce per capita land consumption, reduces per capita vehicle ownership and travel, and increases the portion of trips made by walking, cycling and public transport, which provides numerous savings and benefits compared with the same people living and working in sprawled locations,” he said. Once considered primarily a blight of developed countries, the problem has now gone global, according to UN Habitat. In Guadalajara, Mexico, between 1970 and 2000, the surface area of the city grew 1.5 times faster than the population. The same is true for cities in China; Antananarivo, the capital of Madagascar; Johannesburg, South Africa’s largest commercial hub; and the capitals of Egypt and Mexico, Cairo and Mexico City, respectively, the agency says. In Latin America, sprawl has wreaked serious damage on environmentally sensitive areas. These include Panama City and its surrounding Canal Zone, Caracas and its adjacent coastline, San José de Costa Rica and its mountainous area, and São Paulo and its water basins. “For more than half a century, most countries have experienced rapid urban growth and increased use of motor vehicles,” U.N. Secretary-General Ban Ki-moon noted in the Global Report on Human Settlements 2013. “This has led to urban sprawl and even higher demand for motorized travel with a range of environmental, social and economic consequences. Reversing this trend now is critical, since projections show that between 1950 and 2050, the human population will quadruple and shift from 80 percent rural to nearly 80 percent urban. Typical urban densities today range from 5-20 residents per hectare in North America, 20-100 residents per hectare in Europe, and more than 100 residents per hectare in many Asian cities. In addition, zoning codes and development policies often discourage urban development and favour sprawl, and transportation policies excessively favour investments in car travel. As a positive example, he said, many jurisdictions have ‘complete streets’ policies which recognise that public roads should be designed to service diverse users and uses, including walking, cycling, automobile, public transit, plus adjacent businesses and residents, so planning should account for the needs of pedestrians, cyclists and sidewalk café patron, not just motorists. “Many cities are doing well on some [projects and policies] but not others. For example, Los Angeles is improving walking, cycling and public transit, but doing poorly in allowing compact infill development. Vancouver has great density near downtown but needs to allow more density in other areas. Portland and Seattle have great cycling facilities, but could have more bus lanes. “Virtually no city is implementing all of the policy reforms that I think are justified based on economic efficiency and social equity principles,” Litman concluded.